Our next SF Blind Cafe is now booked for March 21 - 23rd at The Potrero Hill Neighborhood House! :) Stevie Wonder used to perform in the space we are holding this event! Good Omen right? 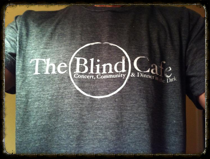 We dream that someday Stevie will come join us in the dark at The Blind Cafe for a discussion and concert! Do you have any connections? Help us manifest him!